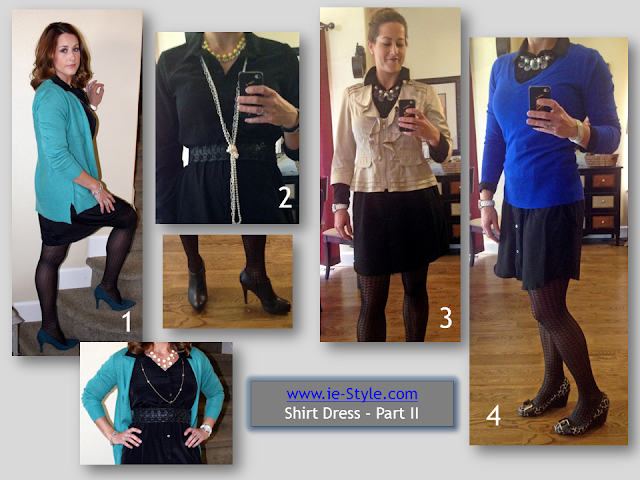 I hope you found some inspiring tidbits on Shirt Dress - Part I. Part I focused on more casual looks you could do with this Shirt Dress, while this post will focus more on professional & Holiday looks. 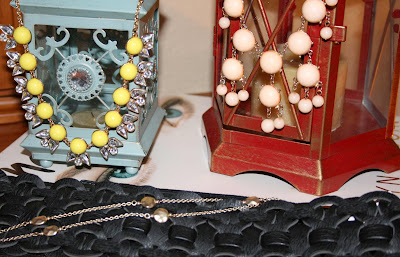 To achieve a Holiday Party look all you really need to do is add some bling, sparkle, and/or shine! This could be through jewelry or by adding jackets, sweaters, or scarfs with sheen or metallic elements to them. You'll see below that I also added patterned tights & heels, but you could easily achieve the same looks with non-patterned tights & flats or a kitten heel shoe. All of these looks will also work for the professional environment, but I would recommend toning down the "glitzy" pieces for the office. For a quick & easy "wear to the office" look, I simply added a long teal cardigan, large black belt, peach statement necklace layered with a gold chain, patterned tights & dark teal pumps. Comfortable & easy to achieve! I kept it simple again for this Holiday Party look. I added a yellow & crystal statement necklace & layered that with a long strand of pearls knotted with a silver chain. Again, I stuck with the black belt & patterned tights to add texture, & I wore my platform ankle heels. I keep saying "Holiday Party" look (due to the time of the year), but of course you could wear something like this for a night-on-the town, cocktail party, or similar occasion. Sweater look familiar here?! Yep, you got it...its the bargain sweater from this post! Yet another way you can wear it (clapping emoticon here)! Have you ever thought about putting a sweater over a dress? Look how great it works! Just be careful that you use a "fitted" sweater rather than one that is too "boxy". Everything else on this outfit is the same as number 3, I just changed out the jacket for the sweater, & I love the outcome! Long story short - there are a ton of options for this dress & any dress that is similar. I could have kept going with more options, but I think you get the point. 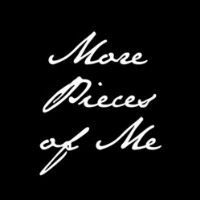 I'd love to hear from you about what these examples may inspire you to put together! Please also leave a comment below if you'd like to know any specific brands of anything you see pictured.